Raymond Addy married Elizabeth F. Rupp, daughter of Frank A. Rupp Jr. and Nettie Louisa Zimmer. Raymond Addy was born on 20 February 1895 at Cherokee, Iowa. He died on 21 December 1971 at Cherokee, Iowa, at age 76. (?) Young married Gladys M. Rupp, daughter of Frank A. Rupp Jr. and Nettie Louisa Zimmer, before 1964. Married Name 4 May 1940 As of 4 May 1940,her married name was Rupp. Beulah Jane Pelton married Joseph John Rupp, son of Frank A. Rupp Jr. and Nettie Louisa Zimmer, on 4 May 1940. William Rupp was the son of Joseph John Rupp and Beulah Jane Pelton. William Rupp died before 1954. Joseph Rupp was the son of Joseph John Rupp and Beulah Jane Pelton. Rolland Rupp was the son of Joseph John Rupp and Beulah Jane Pelton. Rolland Rupp died before 1954. Gilman Fee married Lillian Mary Bauer, daughter of John H. Bauer and Stella Mary Zimmer. Robert Loucks married Leona Dora Bauer, daughter of John H. Bauer and Stella Mary Zimmer. Married Name Her married name was Glassmaker. Frances Zimmer was the daughter of John E. Zimmer and Mary Lawry. Frances Zimmer married William Glassmaker. William Glassmaker married Frances Zimmer, daughter of John E. Zimmer and Mary Lawry. Married Name 27 November 1932 As of 27 November 1932,her married name was Soeldner. Loretta Hauser was born on 16 February 1910. She married Andrew Soeldner, son of Joseph Soeldner and Kathryn Roth, on 27 November 1932. 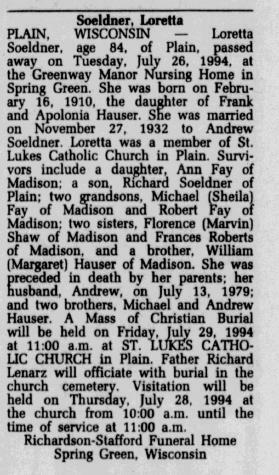 Loretta Hauser died on 26 July 1994 at age 84 Loretta (Hauser) Soeldner obituary. Herbert E. Runde married Patricia Faherty. Herbert E. Runde was born on 5 October 1930. He was the son of Arnold Henry Runde and Eveline Theresa Wiegman. 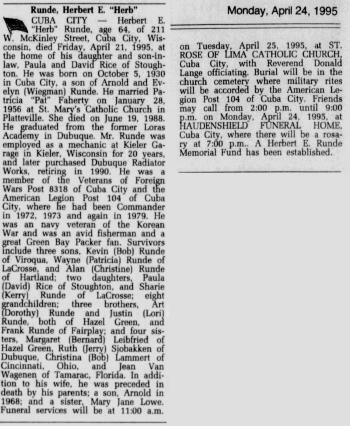 Herbert E. Runde died on 21 April 1995 at age 64 Herbert E Runde obituary. Patricia Faherty married Herbert E. Runde, son of Arnold Henry Runde and Eveline Theresa Wiegman. Margaret Runde was the daughter of Arnold Henry Runde and Eveline Theresa Wiegman. 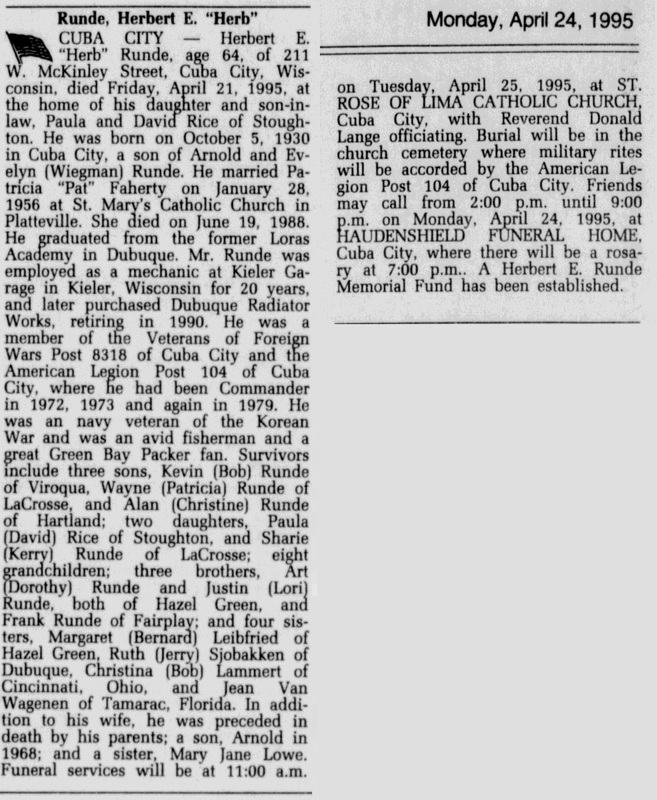 Margaret Runde married Bernard Charles Leibfried, son of John Bernard Leibfried and Roselinda Catherine Hufnagel. Lauren Helen White died on 12 October 2007 Lauren Helen White obituary. She was born on 12 October 2007. Gerald Charles Melssen was born on 26 June 1949 at Dickeyville, Grant, Wisconsin. He was the son of Henry A. Melssen. Gerald Charles Melssen died on 6 February 2016 at age 66 Gerald C. Melssen, 66, of Epworth, Iowa, passed away Saturday, February 6, 2015 at his home in Epworth, Iowa after a short but courageous battle with lung cancer. Friends and relatives of Gerald may call from 3 to 8 p.m., Tuesday, February 9, 2016 at the Reiff Funeral Home in Epworth, Iowa where a wake service at 4:00 p.m.
Services for Gerald will be held at 10:30 a.m., Wednesday, February 10, 2016 at St. Patrick’s Catholic Church in Epworth, Iowa with Rev. Richard Kuhn presiding. Burial will be held in Highview Cemetery in Epworth, Iowa, with full military honors afforded by the Epworth John White American Legion Post #650. Gerald was born June 28, 1949 in Dickeyville, Wisconsin, son of Henry and Mary Ann (Kieler) Melssen. He graduated from Wahlert High School in 1967. On December 21, 1974 he was united in marriage to Sandra King at St. Patrick’s Catholic Church in Epworth, IA. He worked at John Deere Dubuque Works for 40 years until his retirement in May of 2012. Gerry was an avid hunter and fisherman. He enjoyed camping, woodworking and spending time with his grandchildren. He is a Veteran having served in the United States Air Force for four years, three of those years were served in Bitburg, Germany. Gerald was a member of the St. Patrick’s Parish in Epworth, IA and the Epworth John White American Legion Post #650. He is survived by his wife, Sandra Melssen of Epworth, IA; three children, Sara (Jay) Upmann of Stockton, IL, Dawn (Tyson) Yohe of Wilton, IA, and Eldon (Jodi) Melssen of Burlington, IA; the pride of his life was his five grandchildren, Cameron and Caeden Upmann, Maxwell and Madelyn Yohe and Carter Melssen; his mother, Mary Ann Melssen of Dickeyville, WI; seven siblings, Mary Jo (Ronald) Lau of Clarksville, TN, Doris (Harold) Kelly of Dubuque, Lee Ann Melssen and Linda Morshead both of Polk City, IA, Donald Melssen of Phoenix, AZ, Henry Melssen of Dickeyville, WI, and David (Rita) Melssen of Dickeyville, WI; one sister-in-law, Ellen LaPage of Dyersville, IA; one brother-in-law, Harvey (Beta) King of Epworth, IA. He is preceded in death by his father Henry A. Melssen; grandparents, Charles and Josephine Kieler and Leo and Barbara Melssen; one sister-in-law, Mary Lou King, and one brother-in-law, John LaPage. Frank Charles Lange married Louise C. Kunkel, daughter of Edward Bernard Kunkel and Katherine Alt. Frank Charles Lange was born on 23 December 1902 at Paris, Grant, Wisconsin. He was the son of Charles Joseph Lange and Mathilda Kieler. Frank Charles Lange died on 6 January 1997 at Grant, Wisconsin, at age 94. Arnold L. Lange was born on 9 May 1916 at Wisconsin. Arnold L. Lange married Catherine E. Salzmann, daughter of Adolph J. Salzmann and Anna M. Averkamp, on 20 August 1947. Arnold L. Lange died on 6 March 1979 at age 62 also reported as March 6, 1978. [S250] U.S. Federal Census 1930 U.S. Federal Census, by Ancestry.com, Year: 1930; Census Place: Paris, Grant, Wisconsin; Page: 2A; Enumeration District: 0037. Name Variation Ervin Lange was also known as Tony. Ervin Lange was born on 19 February 1911 at Wisconsin. Ervin Lange married Marian Balbina Salzmann, daughter of Adolph J. Salzmann and Anna M. Averkamp, on 16 February 1944 Marian Salzmann and Ervin Lange marriage announcement. 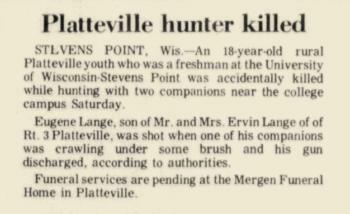 Ervin Lange died on 20 November 1984 at Platteville, Grant, Wisconsin, at age 73. 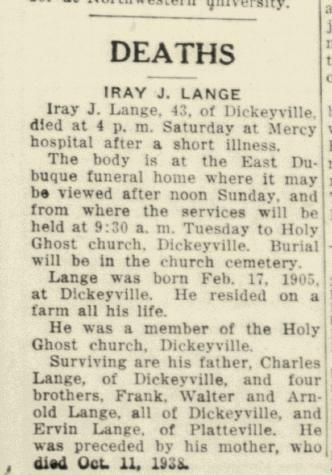 Name Variation Ira John Lange was also known as Iray John. Name Variation Ira John Lange was also known as John Irenus. Ira John Lange was born on 17 February 1905 at Paris, Grant, Wisconsin. Ira John Lange was the best man at the wedding of Walter J. Lange and Bernice E. Schwab in November 1929; Bernice Schwab and Walter Lange marriage announcement. Ira John Lange died in March 1948 at age 43 Ira John Lange obituary. John Lange was born in 1837. He married Elizabeth Jansen after 1865. John Lange died in 1911. Married Name before 1860 As of before 1860,her married name was Frembgen. Married Name after 1865 As of after 1865,her married name was Lange. Elizabeth Jansen was born in 1840. She married Anton Frembgen before 1860. Elizabeth Jansen married John Lange after 1865. Elizabeth Jansen died in 1913. Henry Aloysius Lange was born on 17 October 1877 at Grant, Wisconsin. He was the son of John Lange and Elizabeth Jansen. Henry Aloysius Lange married Mary S. Gubbels in 1901. Henry Aloysius Lange died in 1957. Name Variation Dorothea Agatha Lange was also known as Dora. Married Name Her married name was Splinter. Dorothea Agatha Lange married (?) Splinter. Dorothea Agatha Lange was born on 21 February 1882 at Grant, Wisconsin. 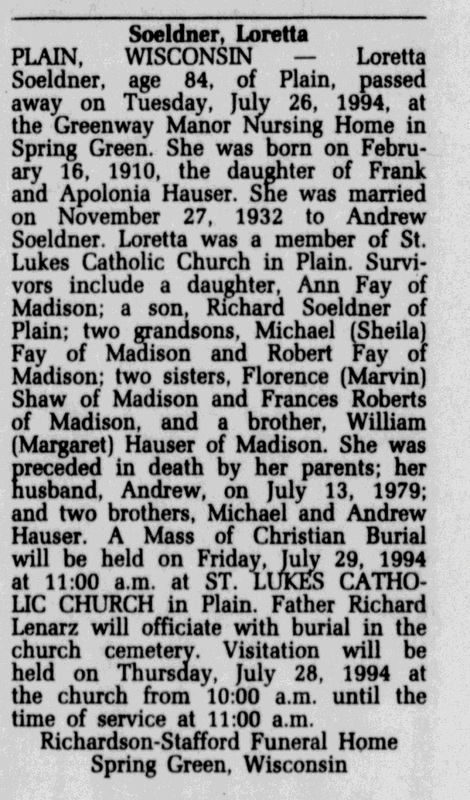 She was the daughter of John Lange and Elizabeth Jansen. Dorothea Agatha Lange died on 4 October 1963 at Grant, Wisconsin, at age 81. (?) Splinter married Dorothea Agatha Lange, daughter of John Lange and Elizabeth Jansen. Name Variation Marian Balbina Salzmann was also known as Salzman. Name Variation Marian Balbina Salzmann was also known as Marion. Married Name 16 February 1944 As of 16 February 1944,her married name was Lange. Marian Balbina Salzmann was born on 15 September 1922 at Grant, Wisconsin. She was the daughter of Adolph J. Salzmann and Anna M. Averkamp. Marian Balbina Salzmann married Ervin Lange, son of Charles Joseph Lange and Mathilda Kieler, on 16 February 1944 Marian Salzmann and Ervin Lange marriage announcement. Marian Balbina Salzmann died on 17 November 2001 at Grant, Wisconsin, at age 79. Eugene A. Lange was born on 12 November 1954. He was the son of Ervin Lange and Marian Balbina Salzmann. Eugene A. Lange died on 2 December 1972 at by accidental shooting while hunting, Wisconsin, at age 18 Eugene A Lange obituary. Michael Lange was born on 22 February 1957. Michael Lange died on 30 October 1985 at Grant, Wisconsin, at age 28. Louise C. Kunkel married Frank Charles Lange, son of Charles Joseph Lange and Mathilda Kieler. Louise C. Kunkel was born on 9 June 1900 at Iowa. She was the daughter of Edward Bernard Kunkel and Katherine Alt. Louise C. Kunkel died on 8 December 1991 at Grant, Wisconsin, at age 91. Married Name Her married name was Tranel. Mary Agnes Lange married Oswin Herman Tranel. Mary Agnes Lange was born on 16 December 1926 at Dickeyville, Grant, Wisconsin. She was the daughter of Frank Charles Lange and Louise C. Kunkel. 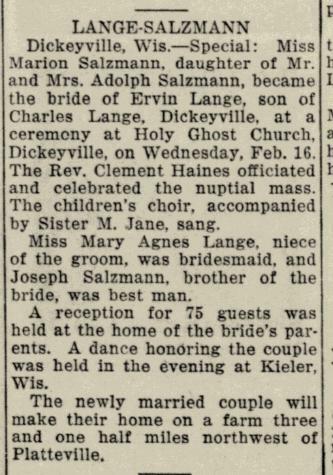 Mary Agnes Lange was a bridesmaid at the wedding of Marian Balbina Salzmann and Ervin Lange on 16 February 1944; Marian Salzmann and Ervin Lange marriage announcement. Mary Agnes Lange died on 3 November 2002 at Cuba City, Grant, Wisconsin, at age 75.